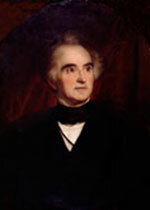 Justus von Liebig enrolled at FAU in 1821. He went down in history as one of the most famous and successful chemists of his century and the father of organic chemistry, agricultural chemistry and nutritional physiology. His inventions include mineral fertilisers, silvered-glass mirrors, chloroform, radical theory, meat extract, baby food and baking powder.